Ontario's electricity rates are rising for most, and that's not due to external factors nearly as much as the deliberate policies of the Ontario government couple with the performance of the system operator (IESO). I've written recently on traders in the Ontario market benefiting from low Ontario electricity prices, and on suppliers manipulating government policy and practices making larger entities more influential. This post will focus on the "Class A" global adjustment which, because it works to eliminate any possibility of a market in Ontario functioning as a tool to indicate the adequacy of supply levels, is the worst "stakeholder" driven policy of all. Ontario is proposing to help the province's largest industrial companies and manufacturers conserve energy in a way that will have little to no impact on electricity bills for Ontario families. Since the process was introduced for 2011 I estimate the direct "little to no impact" has been over $2 billion and has grown to a cost of over $750 million a year. This direct cost shift has an impact of about 0.66 cents/kWh ($6.64/MWh), which makes it essentially a new charge equivalent to the retiring, for 2016, debt retirement charge. 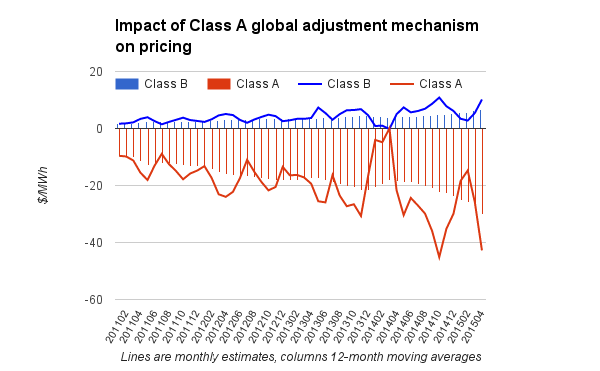 Despite the high cost of the class shift, which will be explained further, I'll argue there are secondary impacts from the behaviour encouraged by the mechanism. A refresher on the global adjustment: most supply in Ontario is contracted or set at regulated costs. Market pricing recovers little of the contracted, or regulated, cost as the market price is now mainly a tool for the IESO to order generators for dispatch - not to recover the costs of generation. The difference between the costs of supply and the dollars recovered in the dysfunctional market is the global adjustment. The "Class A" policy was introduced after market prices collapsed early in 2009 coincident with contracted supply, and costs, expanding. Ontario's largest industrial users were demanding the lower rates adjacent jurisdictions were realizing, and fiddling with the global adjustment did provide an opportunity to reduce their costs. The Class A global adjustment mechanism, essentially rebranded in 2013 as the Industrial Conservation Initiative (ICI), set the share of the total global adjustment allocated a consumer with over 5,000 kilowatt monthly peak consumption as their percentage of total consumption during the previous adjustment period's 5 highest daily peaks (known as the 5 coincident peaks hours, or "5 CP" - or "Hi-5"). Laudable goals, but comments posted to the Environment Registry demonstrated an understanding that the program offered a poor method "to avoid costly investments in new peaking generation resources." Looking at the ensuing numbers, how poor a method is stunning. 12-month consumption in the Class A class has risen about 3 TWh since 2011, to 25.6 TWh. This equates to average consumption of a little under 3000 megawatts: if the class A strategy reduced usage from this level to nothing during the 5 coincidental peak hours, the cost of avoided peaking capacity would still be ~$250,000 per megawatt, which is more expensive than the net revenue requirement contracts on most of Ontario's natural gas capacity. We know that usage didn't go near zero, but to around 2300MW: a study done for the Market Surveillance Panel of the Ontario Energy Board stated, "post-policy electricity usage by industrials were roughly 200 MW lower during Hi-5 days in June, July, and August of 2011-12, relative to Hi-5 days in 2009." In the ensuing 2 years I suspect another 300 MW reduction by Class A consumers during Hi-5 hours, but that 500 MW reduction puts the cost to class B ratepayers of one megawatt of peaking capacity reduction during the 2013-14 adjustment period over $900,000/MW. The actual cost of Class A negawatts is far in excess of the cost of actual generating capacity. The Class B global adjustment mechanism put forward by Tom Chapman is lousy as a method of avoiding the need for capacity, but excellent at lowering the cost of electricity for Class A consumers. Since class B consumption is still 4.5 times greater than Class A consumption, the average $6.64/MWh (0.66 cents/kWh) shifted to class B consumers over the past 12 months reduces the average class A consumer's cost by a far more significant $30/MWh. The Industrial Conservation Initiative provides a strong incentive for large electricity consumers to shift their electricity consumption to off-peak hours to save on average 15 to 20 per cent on their energy bills. Ontario is proposing to expand the program to include eligible customers with monthly peak demand greater than three megawatts, down from the current threshold of five megawatts. This would open participation to hundreds of additional medium-sized electricity consumers. The "hundreds" of new Class A customers will increase the cost shift to other Ontario ratepayers as of May 2015 (this month). The IESO is proceeding with the Large Renewable Procurement process intended to contract more of the least valuable supply in the province (wind). Conservation spending remains high despite the reality that Ontario is almost always a net exporter, and the average net export during the most recent hi-5 hours (May 1, 2014 to April 30, 2015) was 1909 megawatts. There is no savings on peak capacity nor is there expected to be insufficient capacity for peak demand until late this decade. 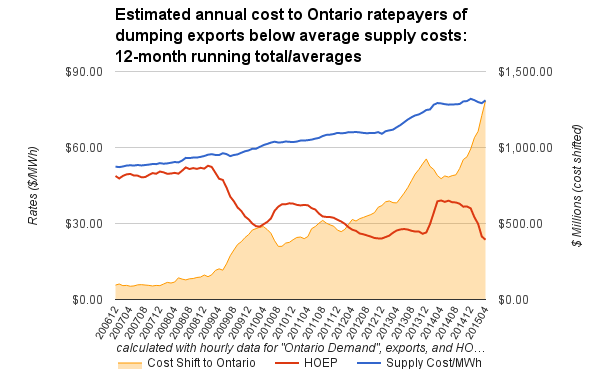 When HOEP was forecast to rise to moderate levels on February 19, 2015, the IESO activated Demand Response programming - paying participants to curtail consumption. The price levels forecast were far below pricing required to incent new supply in a real market. DR3 participants that are also Class A consumers appear to have been provided a double dip (hour 20 of February 19 is a Hi-5 hour). The activation was all the more ridiculous as Ontario was a net exporter of in excess of 2500 megawatts for the duration of the demand response period. Capacity payments may change form, but the plan is to continue paying for capacity through a capacity auction run by the IESO's Tom Chapman (the man who posted the Class A plan on the Environmental Registry while at the Ministry of Energy). To the extent Chapman or anybody else at the IESO should be considered experts on markets, it's in manipulating them to function poorly. The results of all the efforts to bloat supply and depress market pricing are apparent in data. The rate Ontario exports has never been higher. The first 4 months of 2015 are the 4 highest months by hourly net export since the market opened in May 2002; 8 of the top 10 months have occurred in the past 9 months. 5 of the 10 lowest priced months since market inception occurred over the same period, despite a cold, high demand, winter. Looking at 12-month moving averages, net exports have never been higher, while market pricing (HOEP) has never been lower. This shifts a disproportionate share of the cost of supply onto Ontario ratepayers. 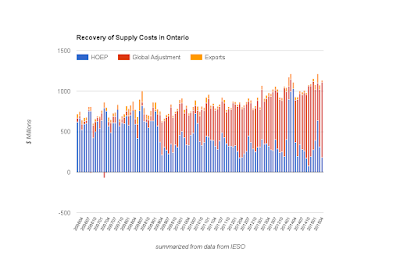 To estimate that cost, I have calculated the average cost of supply as the HOEP value of all "Ontario Demand" and Exports reported by the IESO, plus the global adjustment, divided by the sum of "Ontario Demand" and Exports. In the most recent 12-months this method exposes market sales of exports have recovered $1.3 billion less than the supply costs; $1.3 billion that has been charged to Ontario's ratepayers, via the global adjustment. - but that's far less than the benefit to "Class A" types realized from a depressed HOEP caused by excessive supply. I won't speculate here on how much of the remaining $1.175 billion is due to the systemic incentive to oversupply Ontario's market, but industrial pricing policy dependent on a low HOEP is certainly responsible for a significant portion of this cost shift to "Class B" consumers. for all consumer classes from an average of $52.46/MWh to $78.62/MWh (50%). The regulated price plans (RPP), for residential and many small business consumers, averaged $5.9 cents/kWh in December 2006, and now average 10.2 (a 73% increase). Over one-third of the inflation seen by most consumers is due to shifting the burden of paying supply costs from Class A consumers, and exporters, onto the smallest consumers. 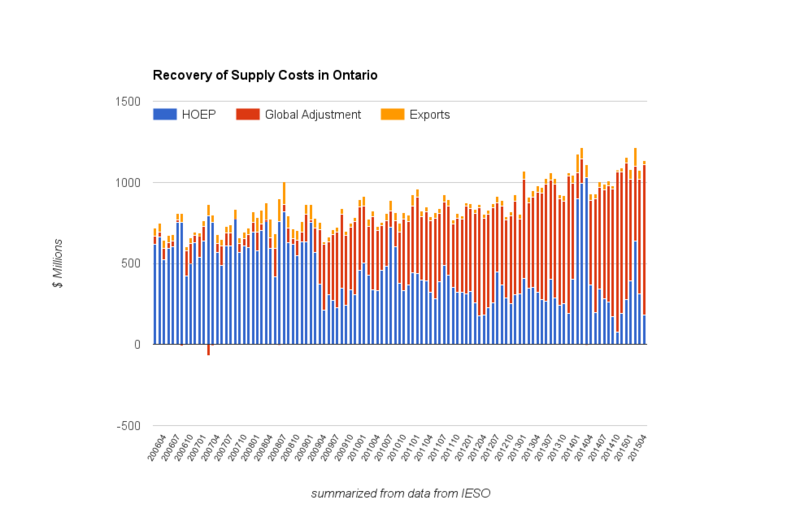 Pessimistically reviewing the current situation, large industrial users continue to claim Ontario's pricing is not competitive, while the Class A global adjustment mechanism designed to benefit them has resulted in the functional abandonment of market pricing, reducing the HOEP to a tool for the IESO to order suppliers for dispatch. The province's residential and small business consumers are left paying for record export levels yielding record low rates incented by this poor policy instrument that all government entities - from the Premier and the Ministries of Energy and the Environment (and Climate Change) to the IESO, are heavily invested in, politically. In reality the policies drive subsidized exports and result in increasing residential energy poverty. Optimistically, the proposed sale of Hydro One does offer a glimpse of hope. Hydro One is one of the entities that survived the monolithic Ontario Hydro in 1998, another was the Independent Market Operator - which later morphed into the IESO. With no efficient market being operated, an independent Hydro One looking to expand its business and deliver increased value to its end customers should consider displacing the IESO. Returning the operation of the system to the owner of the transmission wires will be a simple step should the political winds change in province and a focus on delivering value emerge. Issue: Several mid-sized consumers provided support for the proposal but urged the government to expand its coverage to include smaller consumers. Response: The government will monitor implementation of the amendment and consider expanding coverage should it become apparent that there are short and long term benefits to all electricity consumers from doing so. Issue: Comments expressed concern that the consultation process was not inclusive and that the proposal did not provide sufficient evidence to support its rationale. Gerdau Ameristeel fully supports and agrees with the Minister’s proposed 5 CP allocation of the Global Adjustment. Gerdau has years of experience operating under a similar regime in other jurisdictions and we also offer our technical support to ensure the detailed regulations deliver the intended results. Basing the global adjustment on a customer’s electricity demand during the five critical peak demand days will provide a necessary incentive to Ontario manufacturers, including our steel plants in Whitby and Cambridge, to manage their electricity use more effectively on the most critical days of the year. ... there is a strong likelihood that the proposed modification is excessive, and can lead to large volume customers paying much less than their fair share of the global adjustment. Although it may be correct to say that large volume customers are not the primary drivers of costs to meet peak demand, it is incorrect to imply that all or even a large majority of global adjustment costs are incurred because of peak consumption. Most of the generation in Ontario is under some form of contract or regulated pricing, including production from nuclear plants and baseload hydroelectric plants, i.e. payments are being made to have plant available at all times, and not just to meet the larger demand in peak periods. Moreover, a majority of wind-powered energy - paid for under the FIT program and appearng in the Global Adjustment - will occur off-peak since there is a tendency for more wind energy earlier in the day and during non-peak months. As a consequence a large portion of Global adjustment, possibly approaching half, may be associated with production during off-peak hours. ...the effect of the proposed regulation benefits large consumers at the expense of residential ratepayers. ...The Ministry of Energy has not appeared to have any open consultation process. The Independent Electricity System Operator, who played a large role in this process, apparently consulted primarily with the Association of Major Power Consumers of Ontario (AMPCO) and the Association of Power Producers of Ontario (APPrO). The former group is a major beneficiary of the changes while the latter group creates the huge portion of costs that are being reallocated as part of the initiative. ...cutting 1 MW during the ‘High 5’ hours produces a benefit of $ 168,000 (based on an estimated transitional reporting period ‘High 5’ peak average of 23,800 MW). This far exceeds the annual net revenue requirement (assuming a net market revenue of zero) of a simple cycle gas turbine (SCGT) or similar power plant that would otherwise provide power during those five annual hours. Looking down the road to 2015, the picture gets worse. To estimate how much worse it gets one requires an estimate of potential increases to the Global Adjustment. In the absence of information from an agency such the Ontario Energy Board, an alternative source of information in the public domain is the evidence filed by the Canadian Manufacturers and Exporters (CME) in Hydro One Network’s current rate case. An inspection of that evidence reveals the fact that between now and 2015 annual Global Adjustment costs could rise by about $ 6 billion. With total Global Adjustment costs of $ 10 billion and a normal weather ‘High 5’ peak average of about 21,000 MW, under this proposal the annual value of one avoided MW for five hours will rise to a staggering $ 476,000. This amount is more than enough to build a SCGT power plant and pay for it in UNDER TWO YEARS. 1. This estimate should not be very controversial. In 2013 this amounted to approximately $519 M in GA costs that would have been paid by Class A consumers under the old allocation of the GA but which are now paid by Class B consumers. 2. We know the Class A consumption during Hi-5 hours because the next years' share of the global adjustment paid by Class A equates with their share of consumption during the hi-5 hours. We don't know what that consumption would have been if the the Hi-5 mechanism didn't exist, but trusting the OEB MSP report on the first year allows estimation of future years' reductions. Class A consumption is fairly flat: even from monthly totals we see it is not driven by hot, and cold, as Class B consumption is (graph here). 3. The May 2014- April 2015 adjustment period (based on share of consumption during the hi-5 hours of the 2013-2014 ), charged 9.6% of the total global adjustment to Class A consumers. 4. The Regulated Price Plan (RPP) should equal the Class B pricing over time, but because RPP rates are set in advance of consumption, they are a prediction of average class B pricing - with a variance account kept to adjust future RPP pricing due to over/under recoveries.